Seasoned actors perform original or time tested stories and make them interactive. The children love these sessions! This event happens on the first Friday of every month from 6:30 to 8:30. Rs 500/- per session and this also includes heavy snacks. At the launch of Cheria Aana First, they gleefully prance around acting all important, and then, like VIPs, occupy the front rows when the performances begin, often smugly offering a rejoinder to the performer's questions. All this at the launch of Cheria Aana, a play house. Started by Aysha Rau of The Little Theatre, Cheria Aana is named after Aysha's father, Cheriyan, and means small elephant in Malayalam. Done up in blue, this wooden-floored, 1000-sq ft play house will have three programmes dedicated to young ones. The most unique being Toddler Theatre, a space allotted to theatre workshops for children aged two and three. “We take seven or eight toddlers at a time and perform to 25-30 of them,” says Aysha. She feels it will help provide children an opportunity to appreciate the arts. Also, children will learn to be more expressive and forthcoming. “Research proves that the maximum learning in a child happens between one and five years,” she adds. There are also programmes for children aged three to 15. ‘Strings', targeted at kids three years and above, will bring in puppet shows from across the world, and also create in-house shows. 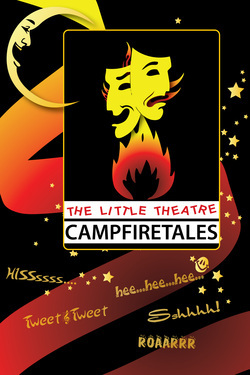 A story-telling workshop, ‘Campfire Tales', will not only keep five- to 15-year-olds entertained but also enable them to write their own stories. The inauguration of the space saw performances that kept the tiny folks as well as the adults entertained. Hans Kaushik narrated the story of three little pigs and the wolf, all the while pulling out people from the audience to enact the characters. “Now we need somebody to be the straw house, and now somebody for the stone house...” the children went into peals of laughter as the wicked wolf was glamorously hoisted up and then toppled into the boiling water. Next came Shakila reading out a passage, with a little song here and a little dance there. “I always wanted to be an actor…Once, I had to act like the sea. I was so good that I gave people sea sickness,” she read out. The final act of the evening was ‘How to pass examinations'. Sounds boring, but not if you watched KK and Joel performing. While KK read out “What to” and “What Not to”, Joel goofily followed his instructions, sending everybody into splits.